The Mock-Up Reactor (MUR) core as seen from the Plum Brook Facility control room. In this historical photo from the U.S. space agency, the Mock-Up Reactor (MUR) core is seen from the control room. Since the MUR generated a very small amount of radioactivity, the "swimming pool" within which it was located provided sufficient shielding. 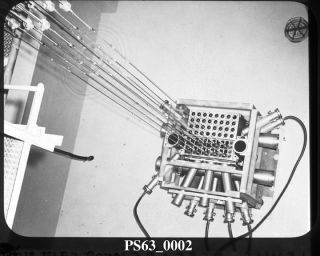 A movable bridge directly above the core allowed MUR operators to easily change fuel or manipulate experiments during shutdowns.